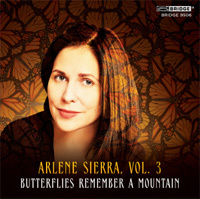 ARLENE SIERRA (b.1970): Butterflies Remember a Mountain for Piano Trio (Nicola Benedetti [violin], Leonard Elschenbroich [cello], Alexei Grynyuk [piano]), Avian Mirrors for Violin and Cello (Jesse Mills [violin], Raman Ramakrishnan [cello]), Truel for Piano Trio, Counting-Out Rhyme for Cello and Piano (Horszowski Trio), Of Risk and Memory for 2 Pianos (Quatro Mani). Description: Like many of Sierra's works, these duos and trios draw inspiration from dynamic processes in the natural world, from language and poetry and from strategy and game theory. Butterflies Remember a Mountain refers to the extraordinary annual migration of Monarch butterflies. The three movements reflect the fragility of the butterflies, their determined quest and the riot of colour as hundreds of thousands of them descend on their destination. The music is full of restless energy, and so is Avian Mirrors, which explores the ritualised calls and responses between birds. Insects and birds, with their rapid, trembling, febrile energy, turn up again and again in Sierra's music, their formalized, repetitive motions and ritual behaviours linked to the composer's interest in formal rule-based games with many possible outcomes, like that explored in Truel. This is a three-way equivalent of a duel, which may lead to unexpected results depending on the mismatched skill or perceived dangerousness of the participants (think of the dénoument of 'The Good, the Bad and the Ugly'). The first movement sets up the parameters of the match in repetitive ostinati, with different characters assigned to the three instruments. Tension rises, then time freezes in the static ostinato patterns of the slow movement. The same gestures finally generate an energetic perpetuum mobile in the last movement. Rhyming games are played out in Counting-out Rhyme, after Edna St. Vincent Millay's eponymous poem; here the repetitions, rhymes, assonances and repetitions of the poem find parallels in the instrumental interactions. Of Risk and Memory requires a virtuosic level of co-ordination between the two pianists, as they throw Messiaenic chords and rapid passage-work at each other, in a thrilling display of alacrity and acrobatics.